It has been a whirlwind two weeks and it’s not quite slowed down yet. We were in Minnesota for Shepherd’s Harvest Festival last weekend and had one day at home before picking up and going to Wooster, OH where we still are now for the Great Lakes Fiber Show. Needless to say, I have been short on spare time for blogging. 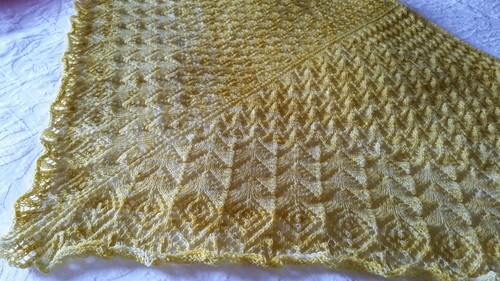 I did manage to get in some knitting, a row or two here and there, and bound off my Edwina Shawl last night. It’s not blocked and that will have to wait until Tuesday after I get home, but here she is. This top photo is more true to the color. It looks like it will be pretty big, but not huge, once it’s blocked out. I am not an aggressive blocker. I like just enough to show off the lace but to maintain some texture and softness. I haven’t weighed the left over ball of yarn but I estimate it to be a bit less than half of the third skein. 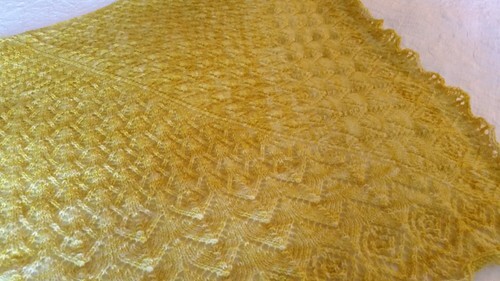 Okay I know this is brief but I just wanted to check in with you all and share my excitement at finishing this shawl. :-) I need to get my stuff together and scoot out the door to the fairgrounds for the day. I will tell you about my next project which I am eager to start and have some finished Edwina pictures when I get back to Nashville. Later!